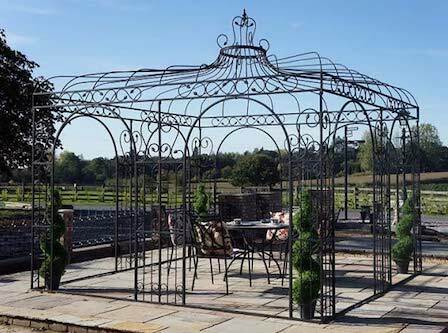 Coming in all shapes, sizes and styles, a metal pergola, gazebo or arch can add height and elegance to your garden. 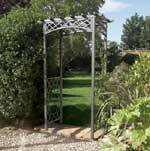 There are some stunning pergolas around! 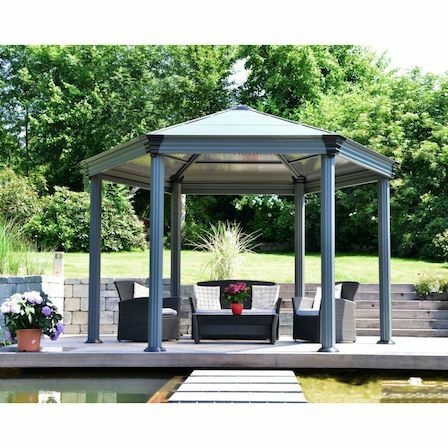 Whether you are looking for an ultra-modern style, or a more traditional ornate structure, there is sure to be one of these wonderful pergola kits to fit in perfectly with your scheme. 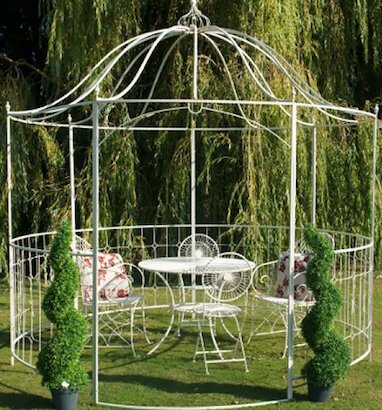 The beauty of metal is that it can be moulded into really intricate designs, making an attractive frame for your climbing plants. 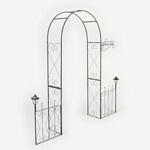 These are usually the wrought iron structures, which lend themselves to a more traditional garden. 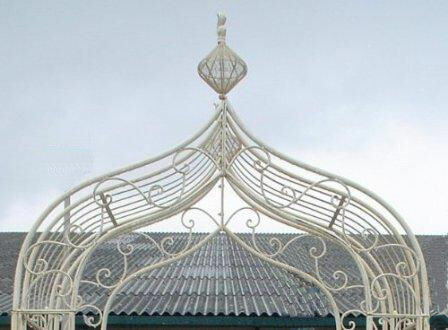 There are some very delicate and ornate structures to be found. 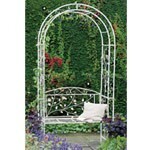 Take this one, for example, with its cream, intricate design, making it look like lace. 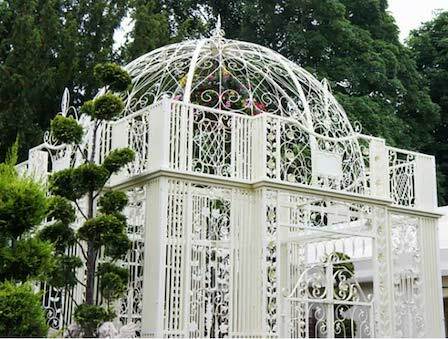 Incredibly beautiful! 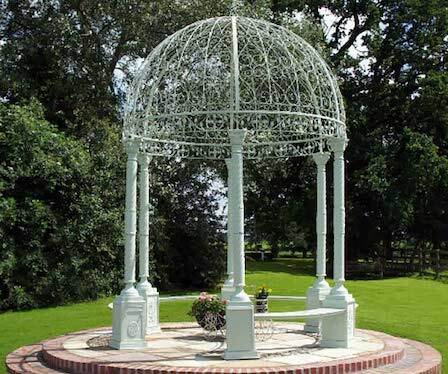 Other ornate metal pergolas and gazebos are shown below. 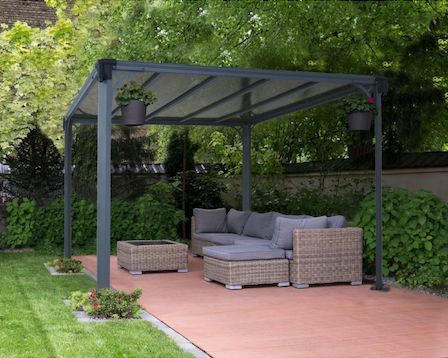 The more modern designs are smoothly crafted to give simple, clean lines that fit comfortably into any contemporary space. 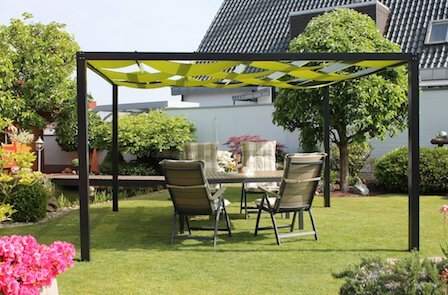 They usually have fixed or moveable fabric shades, making them ideal for eating outdoors. 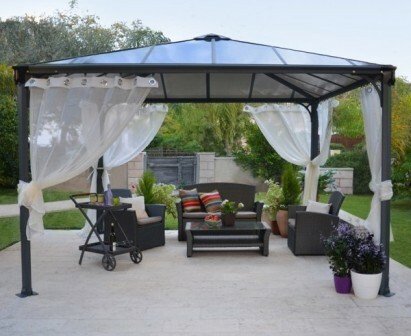 This metal pergola is beautiful in this setting. 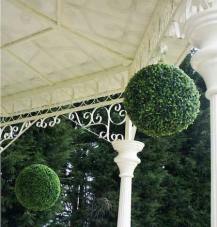 It is modern in style with a traditional twist. 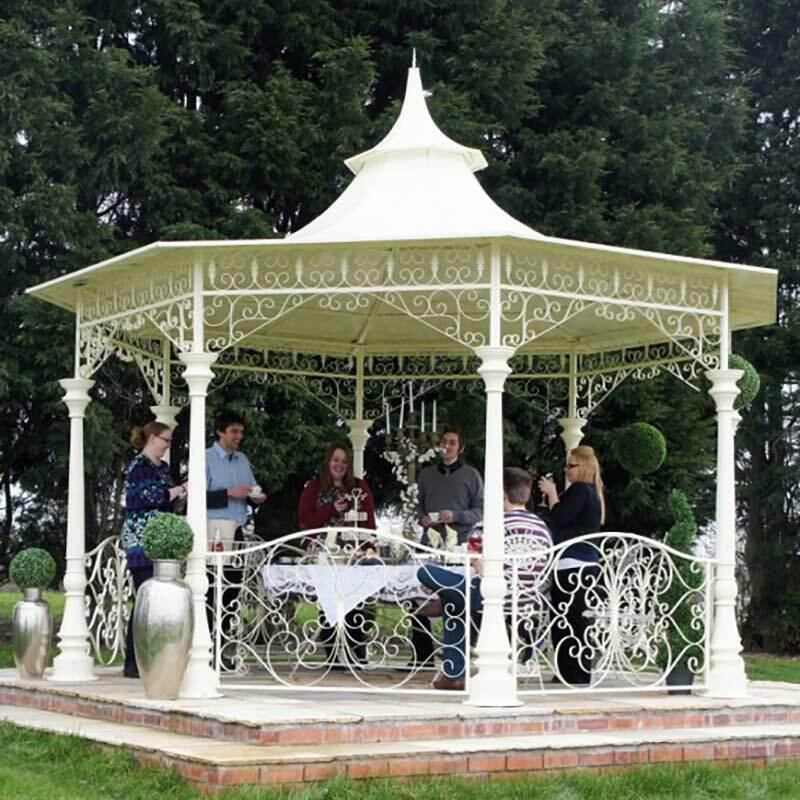 What a fabulous place to have a meal outdoors! 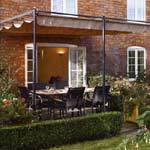 Retractable awnings have become very popular lately as we're all wanting to eat outdoors and extend our summers. 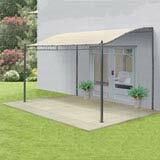 This is a lovely canopy with a retractable awning to give a bit of protection when needed. 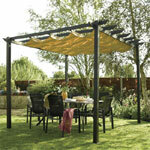 Add contemporary furniture and soft furnishings to give style and comfort to your pergola. 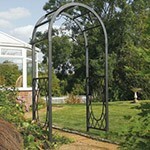 All arches, of course, can be joined by simply attaching one to the next with sturdy plant ties, and trimming off. Easy! 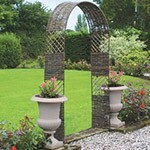 These rose walks are stunning when planted up. 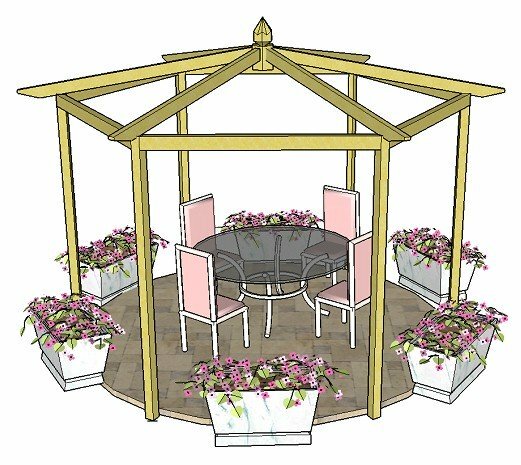 Coming in three different styles, the first of these pergolas are modular in design, meaning they can be added to with any number of additional sections to give any size of pergola colonnade. 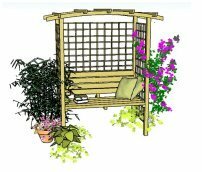 They are high quality products supplied with a starter pack of three sections, which can be added to with single sections to create a longer walkway pergola over which to grow those stunning, fragrant climbing plants you've always dreamed of. 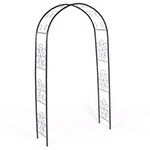 The last one at £7.99 an arch is a very economical way to build a pergola. 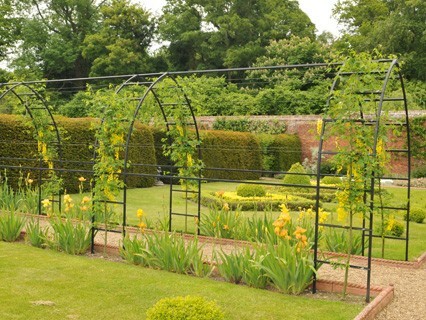 For around £80 it's possible to make a ten section long walkway, with beautiful climbers on each upright. Can't get vexed at that! 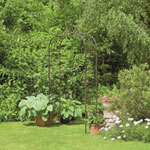 Create a romantic pergola easily, using both climbing plants and vegetables! 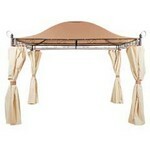 All come in kit form and are relatively easy to assemble. Having another pair of hands, however, is helpful: one to hold while the other fits the parts together. 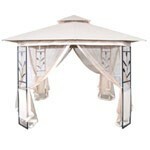 Even the more complex designs should see it finished in an hour or so, in all its glory! 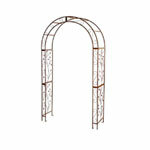 A metal arch may, on the other hand, be more suitable. 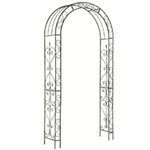 There are some beautifully intricate designs. 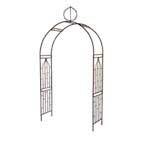 Find this particular selection here. 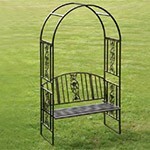 What about this for a swing seat! 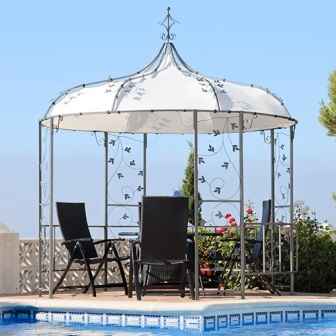 Coated in plastic for easy maintenance. 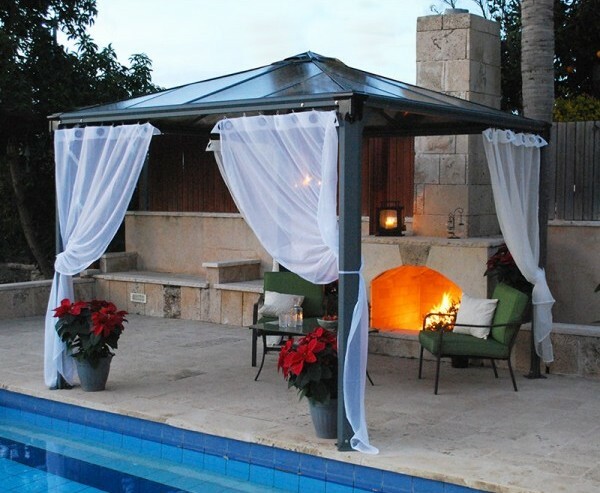 Very romantic covered in throws and cushions! And here are some others. 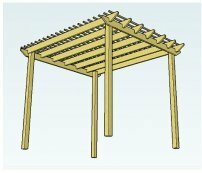 Find ideas on how to incorporate them into your pergola design here.